HomeMOVIE & TVWhy are Reality TV Shows So Popular? Two-time Academy Award-winning documentary filmmaker Bill Guttentag examines the ongoing popularity of reality TV shows. 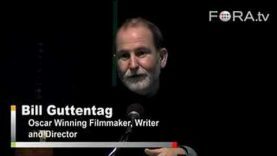 The Real and The Reality of Documentary Film with filmmaker Bill Guttentag. Bill Guttentag, a two-time Oscar-winning filmmaker, wrote and directed Live!, a dramatic feature starring Eva Mendes, Andre Braugher, and David Krumholtz. The film was produced by Chuck Roven/Mosaic Media Group and distributed by The Weinstein Company. He also wrote and directed Nanking, a documentary which premiered at the 2007 Sundance Film Festival. The film includes a stage reading he wrote that features Woody Harrelson, Mariel Hemingway, and Jurgen Prochnow. Nanking was released theatrically this winter by THINKFilm and will air later in the year on HBO. In 2003 Bill Guttentag won an Oscar for the documentary Twin Towers (Universal). It was his second Academy Award; the first was for You Don’t Have to Die, a film he made for HBO. He has also received three additional Oscar nominations, as well as two Emmy Awards. His films have been selected three times for the Sundance Film Festival and have played and won awards at numerous American and international film festivals. His films have received a number of special screenings, including one at the White House.